A vase of flowers was just the right tonic for the start of a new week after not the best of weekends. A Saturday morning allotment visit that could not be avoided despite the pouring rain, ended up being quite enjoyable. We eat lunch and chatted in the community hut with the wood burner crackling away in the background. Tentative plans for tidying up and improving the woodland area that borders the site were made. Maybe a year from now there will be snowdrops in flower for the bees to forage on warmer February days. But then it all went downhill from there. Boarding a bus to take me eventually in the direction of home, I had the misfortune to meet a driver who seemed to be in a hurry. He accelerated like a Formula One driver away from the bus stop before I had a chance to sit. Flesh came into abrupt and painful contact with one of the seat arm rests. A massive bruise is now decorating my left thigh. It is not a pretty sight. Somewhat later after vital shopping I hobbled home to be met with clouds of enveloping smoke coming from the neighbour's garden. In fact I initially thought that a fence was on fire but it turned out to be a false alarm. Just a huge bonfire on a still extremely wet afternoon so it didn't bother me too much. All I wanted to do was to get inside and have a look at the damage to my leg before drowning my sorrows with a cuppa. Sunday turned out much better weather wise. The wet stuff had ceased and it was almost balmy. A great day for gardening jobs I thought despite the hurt but I was to be thwarted. Come 10.00 am or thereabouts there was a sudden rush to close the bedroom window as the mega bonfire entered phase 2 of its existence. This turned out to be an all day job. Suffice to say that by late afternoon I was fuming. Hellebore - not a named variety but a favourite. Some double snowdrops from the garden. Most of them have started to go over now but there are the odd few still in fine fettle. Pulmonaria 'Majesté' - there a few other pulmonarias already in flower much earlier than usual. Narcissus 'Tête -à -Tête' which always makes me smile. Cardamine pratensis. This again is early in flower but is putting on its best show since it was planted in 2013. Thanks to Cathy over at 'Rambling In The Garden' - the calming vibes that come from putting a vase together were much appreciated. 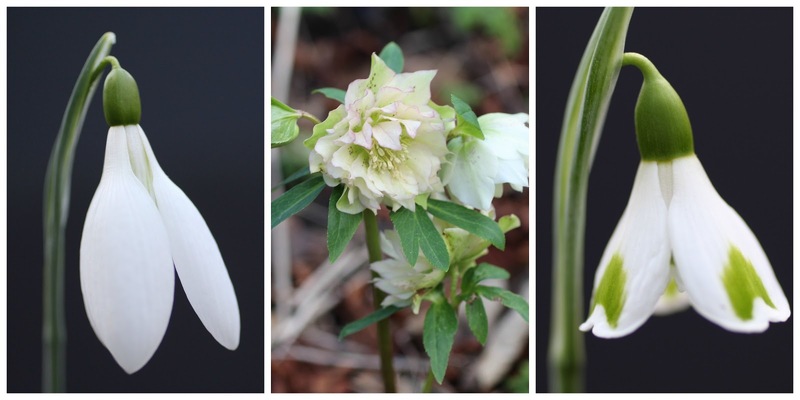 From left to right - galanthus 'Henry's White Lady', unamed hellebore, galanthus 'Trym'. Exactly a year to the date and I'm pleased to report that both my last chance snowdrops are still alive and thriving. 'Trym' and 'Cowhouse Green' were fed when they flowered, were repotted with a generous dollop of leaf mould when dormant and have been under cover during a very wet autumn/winter. The bulbs have rewarded me by increasing in numbers. Funnily enough whilst 'Trym' is open at the same time as last year 'Cowhouse Green' is still to unfurl. The other snowdrop you can see in the above photo is one of this year's newcomers to the fold and goes by the name of 'Henry's White Lady'. Now I have no idea as to the identity of Henry so must do some research. The flower has no green markings on it, whatsoever hence the name. The hellebore in the centre is growing on the bank at the side of the lane leading down to the house. I am puzzled as I although I planted some hellebores there some time ago I don't remember planting this rather frilly and frothy concoction. I'm sure that it wasn't there last year. I prefer the single hellebores but I'm not complaining. As always a special vote to Carol from May Dreams Gardens for providing us with access to flowers from all over the show each month. On a bitterly cold and frosty February day it will mean that I can go out into the garden without my gloves and enjoy flowers. What could be a better occupation? "You cannot have too many aconites. They cost, as I said before, about fifty shillings a thousand. A thousand will make a brave splash of colour, which lasts a month. If you can afford ten thousand you are mad not to buy them. There are so many exciting places you can put them ... in the hollow of a felled tree, by the border of a pond, in a circle round a statue, or immediately under your window, so that you can press your nose against the glass when it's too cold to go out, and stare at them, and remember that spring is on its way"
~ Beverley Nichols, 1898 - 1983. 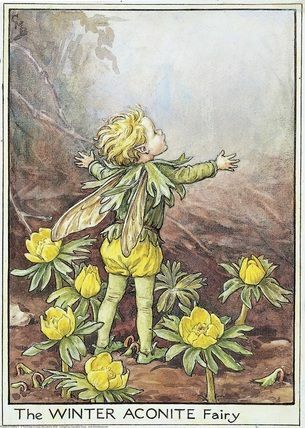 Illustration by Cicely Mary Barker, 1895 -1973. P.S. My financial adviser informs me that fifty shillings is £2.50 in today's currency. Mindful of the weather forecast for a most wet Sunday I hurtled round the garden on Saturday afternoon to pick a few flowers for 'In A Vase On Monday'. Although dry and with some sunshine it was still bitter out there. My ungloved fingers were soon frozen, so it was a case of plonk them in quick and photograph before retreating back inside into the welcome warmth. In the vase (a French yoghurt pot in a former life) are a hellebore flower, some snowdrops and some flowers from viburnum tinus 'Lisa Rose'. The hellebore was one of those chance findings in the garden. I debated over whether to leave it as it was when it was just a seedling but left it to its own devices to grow on, in what in theory is not the ideal place for such a plant. Luckily my hellebore has not read the gardening books otherwise it it would have curled up its toes long since. It's not the showiest of hellebores but I am still most fond of it. Thanks to Cathy over at 'Rambling In The Garden' for getting the week started on a happy note. I'm looking forward to lingering over some no doubt fabulous and unique vasefuls of flowers later on today.